1. With the skin side facing out, score the skin crosswise in parallel lines to about halfway deep in the filet. 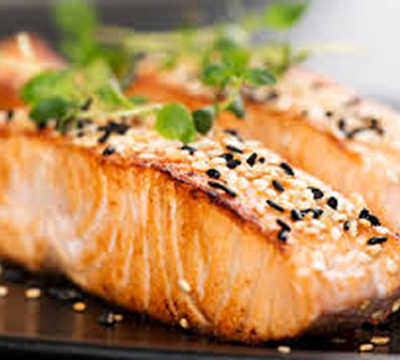 Scoring the salmon filet prevents it from curling while cooking, ensuring it’s cooked nice and evenly. 2. Open each score and sprinkle salt and rosemary into the cut. Glaze the top of the salmon filet with olive oil. 3. Heat oil in a heavy skillet over medium heat. Add salmon, skin side down, as soon as the oil begins to lightly smoke. Keep your fingers on top of the salmon filet for a bit to keep it nice and flat. Watch the side of the piece of salmon for colour changes. When 2/3 of the salmon has turned opaque, flip it to the other side and cook until it’s done.